1. How significant is infected dermatitis to the overall health of a dog? Superficial bacterial skin infections or pyoderma rarely cause significant illness. The clinical signs include itching, pustules, scaling and crusting but affected dogs are usually quite well in themselves. Deep pyodermas, in contrast, can cause fever, malaise and potentially life threatening septicaemia. These are fortunately much less common than superficial infections. Superficial and deep pyodermas, however, are often secondary to an underlying skin disease or immunosuppressive condition that may have a significant impact on the dog’s health. 2. Should infected dermatitis be routinely swabbed for cultures? More than 95% of superficial pyodermas are associated with Staphylococcus intermedius, which have a fairly predictable antibiotic sensitivity pattern. It is therefore not necessary to perform routine culture and antibiotic sensitivity testing on most cases as they will respond to a sensible choice of antibiotic. Those that should be cultured, however, include: cases that do not respond to an empirical antibiotic as expected; cases that have had multiple antibiotic courses; cases where there is cytological or other evidence that non-staphylococcal bacteria are involved; and any cases that are potentially life-threatening. 3. How can an owner tell when dermatitis is infected? Surface infections are characterised by itching, hair loss and moist erosions (often called ‘hot-spots’ or ‘pyo-traumatic dermatitis’). Clinical signs of superficial infections include itching, red papules, pustules, scaling (often in a circular ring called an ‘epidermal collarette’), crusting and hair loss. Deep infections cause swelling, ‘boils’ or ‘furuncles’, ulcers, draining sinuses and abscesses (see figures below). Pyotraumatic dermatitis or hot spot in a dog with itchy ears. The infections is caused by the dog scratching at the affected skin. 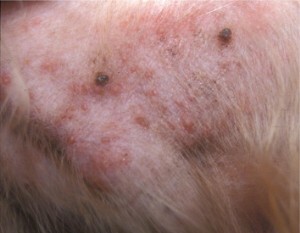 Superficial folliculitis with red papules and pustules in a dog with flea allergic dermatitis. Epidermal collarettes in a dog with a superficial infection on the ventral abdomen. 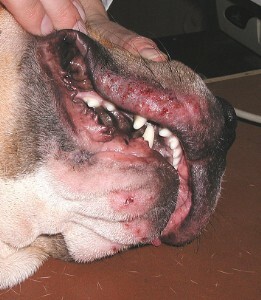 Deep pyoderma around the muzzle in a mastiff cross. None of these signs are 100% specific for infections, however, and suspected cases should be examined by a vet. 4. What Is the main treatment for infected dermatitis? The mainstay of treatment is antibiotics to control the infection. These are usually given systemically but topical antibiotics can be used in localised infections, e.g. ears, chin, eyes etc. Topical antibacterial shampoos, washes, lotions and creams can be used to augment antibiotics and reduce bacterial populations once the infection is controlled. Pus and other debris should be flushed and cleaned out of ears, wounds, abscesses etc. Foreign bodies or implants should be removed. Most infections, however, will recur unless the underlying cause is diagnosed and treated. 5. Are there alternative treatments to antibiotics? See Q4 above. There are a number of highly effective shampoos, gels, washes and ear cleaners etc. Autogenous vaccines, made from cultures taken from the affected animal, are sometimes used in idiopathic recurrent pyodermas (i.e. without a known cause). A veterinary surgeon will be able to advise which products would be most suitable for individual cases. 6. Should antibiotics be started before cultures have been analysed? See Q2 above. Many cases won’t require cultures. In those that do the decision to treat will de-pend on the consequences of any delay. 7. What general rules should owners know about the use of antibiotics in infected dermatitis? It is difficult to apply rules as every case is different. Generally the antibiotic should be effective against the bacteria involved (although this doesn’t always require culture), be given at the appropriate dose (it is always better to slightly overdose rather than underdose) and be given for long enough (superficial infections usually require three weeks treatment; deep infections may require 6-8 weeks or longer). 8. What questions should an owner as the vet about the dermatitis affecting their pet? The most important to know with recurrent infections is what the underlying cause is, what steps are being taken to diagnose this and what other treatments can be used. 9. How significant is the difference between dermatitis that is also infected and that which is not? Many other skin diseases can trigger bacterial infections. The infections will usually make the underlying condition worse and require treatment but it is most important to diagnose and manage the primary disease. 10. What happens if dermatitis is left untreated? This entirely depends on the disease. Most will get progressively worse and the inflammation, itching etc. can become very distressing for the dog. Some conditions can be eventually fatal. 11. Are there any particular things an owner should make sure to point out to the vet? Owners should make sure that they present their pets promptly, give a full and accurate history including whether the pet (or any close contacts), have been abroad, any contagion to other pets or owners and whether any family members have conditions that leave them vulnerable to infections (e.g. chemotherapy etc.). 12. What precautions (if any) should an owner expect a vet to take when operating on a pet either with infected dermatitis or with a history of that? Surgery may need to be delayed until the infection has been treatment although this may not be possible. Antibiotics and antibacterial shampoos can be used to reduce bacterial contamination of the skin or ears if necessary. Full sterile precautions (including preparation of the surgical site, sterile operating theatre and instruments, hand washing and wearing of sterile gown, gloves, hat and mask) and good post-operative care will minimise the risk of wound contamination. 13. What other infections should pet owners be aware of? There are a great many of other bacterial, fungal and viral infections ranging from the trivial to serious, but it is beyond the scope of this piece to discuss them all. 14. What other infections have developed resistance to antibiotics? Any bacteria (and potentially fungal infection, although this is less common) can develop antibiotic resistance. Some resistance patterns are stable and well recognised (e.g. amoxicillin is largely ineffective against staphylococci) and other patterns will be picked up by sensitivity testing. Multiple antibiotic resistance as seen in MRSA and other species such as Pseudomonas is the most worrying problem. 15. How quickly can bacteria develop resistance to antibiotics? It depends on the species of bacteria, the individual situation and the selection pressure they are exposed to. Resistance can occur very quickly, especially in species like Pseudomonas that readily acquire DNA. The main lessons are: don’t rely on antibiotics alone; use antibiotics appropriately; perform cultures and antibiotic sensitivity testing when necessary; and pay attention to hygiene, infectious disease control and sterile surgery. The BVA and BSAVA are taking the issue very seriously but it is also important not to panic: MRSA infections remain rare in animals and is not dangerous to healthy people and pets. MRSA is carried by less than 1% of healthy humans (although this figure is higher in healthcare workers. The oft-quoted 30% figure refers to methicillin sensitive Staphylococcus aureus. We don’t know the carriage rate in animals. Small scale studies show that it is uncommon but the strains recovered from dogs and cats appear to be the same as those in people. Funding is being sought for large scale epidemiological studies to determine the carriage rate in healthy pets.